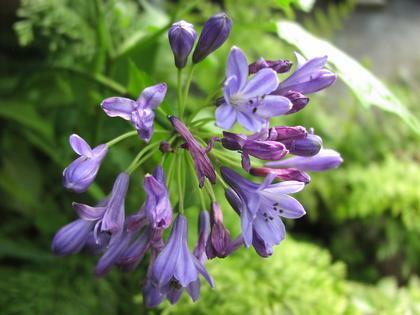 An evergreen dwarf selection with dense blue umbels of small lily-like flowers on dark purple stems. Strap-like foliage is a medium green in a compact clump. This variety is a heavy summer bloomer that bees love. A must have on Suzanne's deck. For best blooming these must be root bound so don't move them up to much larger containers. Overwinter inside with little attention necessary.